The 13th century Charles Bridge is usually packed with tourists and Czechs alike, especially during the spring and summer months. Charles Bridge surely ranks as the most important tourist attractions in the city and should be the first item on your list of sights to see. 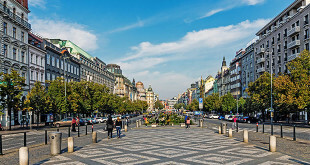 Early morning is the best time to experience a less crowded walk, although a romantic evening walk through the impressively lit streets of Prague by night is nice too. Expect hundreds of souvenir stands as well as an endless variety of street musicians playing their hearts out for you as you stroll across. However, don’t get too carried away by the pleasures because you might just have your pockets picked (actually, this is not a big danger – just be aware of the risk and you’ll be fine). The famous Charles Bridge crosses the Vltava River in Prague. 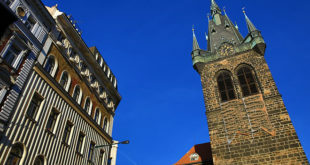 This ‘solid-land’ connection made Prague important as a trade route between east and west Europe. The bridge was originally called the Stone Bridge or the Prague Bridge but has been the “Charles Bridge” since 1870. King Charles IV’s favourite architect and builder Peter Parler, originally built the present-day bridge. The initial idea was to build a functional construction for jousting tournaments, and for many years the only decoration on the bridge was a simple crucifix, but later the desire of the Catholics for ornamentation resulted in 30 statues being built (1600 to 1800 AD). Today most of the statues are copies, due to damage caused by various floods and catastrophes over the centuries. There are now 75 statues and perhaps the most interesting, and oldest, is that of John Nepomuk (no. 8 from the right as you cross towards the castle). The Bridge, which is 516 meters long, contains 16 pillars and 3 bridge towers. One of the towers, the Old Town Bridge Tower, is considered to be the most beautiful bridge tower in Europe due to its rich sculptural decoration. Thirty sculptures that decorate the bridge date mainly from the baroque period – from the 18th century. The most remarkable was one created by Matyas Braun and E. M. Brokoff. John Nepomuk was a priest in Prague under Wenceslas IV. Unfortunately for John Nepomuk, Wenceslas was a suspicious man. One fateful day, the priest received the confession of the beautiful queen. However, Wenceslas was convinced she had told the priest about a suspected love affair, whereupon he demanded rather unsympathetically to know what the Queen had revealed. The priest, being of pious blood, did not break his commitment of confidentiality to the beauty in question and consequently was hauled over the bridge to drown in the Vltava. However, all was not lost for shortly a golden halo appeared over the spot in the Vltava where he disappeared as evidence of his martyrdom, and hence today there is a ring of golden stars over his head on the statue. A few meters in front of the actual statue, there is a small crucifix marking the spot where he was thrown from the bridge. Touch the crucifix and your wish will come true! The majority of the statues on the bridge are actually replicas of the originals – many of the originals can now be found in the National Museum. Despite this, it’s still an impressive sight. Keep your eyes open for Madonna with a dog, St Francis of Assisi (complete with two angels) and a rather sad looking rabbi. 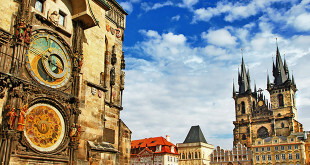 The Charles Bridge Museum chronicles the history of this bridge and is found near the Old Town entrance. Once you see everything that this bridge has been through over the last 650 years, you’ll be amazed it is still there! It costs 150 CZK for adults and 70 CZK for concessions, and their website is at www.muzeumkarlovamostu.cz. Tip: Have your portrait drawn or painted by the artists on Charles Bridge. The Charles Bridge is amazing at night when it is lite the whole experience was so nice,I enjoyed the walk over the bridge.I recommend it! highly reccommend climbing the Old Tower Bridge. It has a gorgeous view. I particularly enjoy it at sunset. 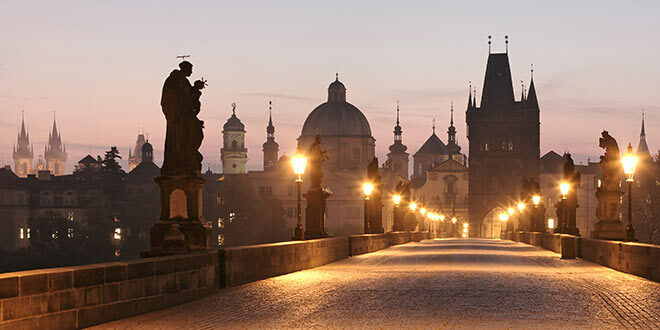 Charles Bridge is one of the world’s greatest romantic locations. Very little compares with an early evening stroll here, as long as you are hand in hand with your lover. If you visit Prague you’ve GOT TO GOT TO GOT TO go to the Charle’s Bridge. It’s beautiful!! Don’t miss it! And walk to the Prague castle, it’s a nice walk with a great view.